The Italian government, looking to stem the flow of migrants to the country, has drawn up a draft code of conduct for non-governmental organisations operating in the Mediterranean Sea, an official said. The 11-point plan is expected to be presented soon to some nine NGOs who regularly deploy rescue boats to international waters just off the Libyan coast. If any group refuses to accept the terms, they risk being barred from Italian ports, meaning they would have to divert to other countries to disembark any migrants. Among proposed new rules will be a ban on making phone calls or firing flares that might signal to human traffickers they could push migrant boats out to sea. The NGO vessels will also be obliged to let police travel with them to help root out human traffickers among migrants aboard. The boats will also no longer be allowed to transfer refugees to other ships but will have to bring them to port themselves, limiting operations. Amnesty International and Human Rights Watch, which received a leaked draft of the Italian document, warned the proposals could have a disastrous impact on NGO missions. “Attempts to restrict NGO search and rescue operations risk endangering thousands of lives by limiting rescue boats from accessing the perilous waters near Libya,” said Iverna McGowan, a senior director with Amnesty International. Some 85,217 migrants have come to Italy so far this year, according to data released by the interior ministry on Wednesday, up almost nine percent on the same period in 2016. In all, more than 600,000 newcomers, the majority from sub-Saharan Africa, reached Italy over the past four years, with tens of thousands more expected in the coming months. A small flotilla of charity boats are increasingly important in rescue operations, picking up more than a third of all migrants brought ashore so far this year against less than one percent in 2014, according to the Italian coastguard. Rome suspects their presence just outside Libyan territorial waters encourages migrants to put to sea. 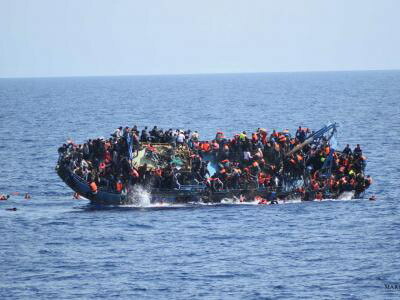 NGOs deny this and say thousands more would die if their boats were not in the southern Mediterranean. More than 13,000 people are estimated to have drowned since 2014 trying to make the crossing to Italy. The code of conduct will include a categorical ban on NGOs entering Libyan waters unless human life is clearly in danger. While viewing the NGOs with increasing suspicion, the Italian government is also frustrated with its EU allies, saying they are not doing enough to tackle the crisis, including taking more new arrivals. Looking to improve co-operation, Italian Prime Minister Paolo Gentiloni met French President Emmanuel Macron and German Chancellor Angela Merkel on Wednesday. There was no sign of any pledges to help relieve the pressure on Italy. “Progress has been made regarding migration policy, but it is not yet sufficient,” Gentiloni told reporters.